It’s been a long, long time since I’ve successfully produced video tutorials for different hand embroidery stitches. The collection of how-to embroidery videos here on Needle ‘n Thread includes over 50 videos of embroidery stitches, but they are all woefully outdated. I’m working on updating the collection, but golly, I’m slow! And on top of that, I think all the planets have to be aligned a certain way for each video to come together as it should! But – today – finally – I’ve got one to share. It isn’t utterly perfect, but I hope you find it useful! When I worked that little whitework fish guy, I received a heap of requests for instructions on the Basket Stitch – so all I can say is, It’s About Time! Basket Stitch can be worked on plain weave or even weave fabric. It looks best when stitched with a twisted non-divisible thread, like pearl cotton, coton a broder, floche, buttonhole silk, or any similar thread. It comes out “ok” when worked with floss, but the finish is a lot smoother, and you can’t see the “weave” of the stitch as clearly. 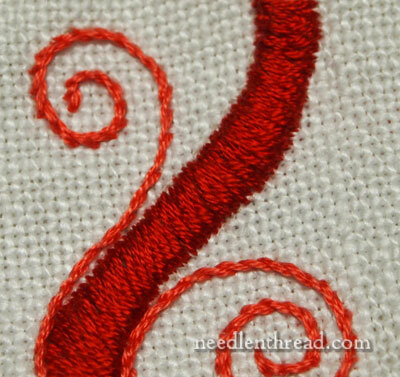 The excerpt above from the spot sampler (stitched in red) is worked in three strands of regular embroidery floss. See how smooth the finished look is, when compared to the white basket stitching on the fish tail above? The white basket stitches are worked with coton a broder. In the video, I’m using perle cotton (#5), which produces a very visible stitch pattern. Here’s the video – it’s rather ancient, but someday, I will update it! For more video instructions for hand embroidery stitches, please visit my collection of How-To Videos for Hand Embroidery Stitches. Thank you so much for sharing and taking the time to do the video. As for re-doing all your other videos….. that’s a serious amount of work so take it easy there! Loved this stitch.. Especially the white and purple samples looked very nice. What all can we use this stitch for? Can this be used for thick stems of a flower? G’morning, All! Thank you for your comments! Hi, Elaine – it is a lot of work, but it’s pretty fun, once all the frustrations of setting up are over! Editing is the best part. I record the voice after the stitch, so I end up doing about umpteen million voice-overs before I can get through it without saying something inane or sneezing or squeaking my chair… or – the worst! – without a train going by! Hi, Preethy – yes, thick flower stems, loose scrolls (doesn’t take tight curves well), borders, wavy lines, etc… I made a few suggestions at the beginning of the video. It works well in wool embroidery, too – so, think crewel work, with various stems and curved lines. It looks like a lot of fun once you get it going. My question: how do you finish off the starting point so it’s even? Just go back and fill in some how? Glad you like it, Cynthia – the stitch is actually very easy, and it makes a great wide line stitch. Hi, Irene – you can start the first stitch with less of a slant, and take the second stitch up a bit higher, to even out the beginning, but your overlap will end up closer to the edge, and the “weave” won’t be as apparent, because it will move towards the sides – but it’ll still look ok, just spaced a bit differently. Thanks for the new video. I’m looking forward to trying this stitch. I have always found your videos so helpful. Thank you Mary. A new stitch for me to practise. Great tutorial. I love little videos. Thanks for putting it together for us. Thank you very much for these vidéos you give us. Wonderful video and very helpful. Thanks for taking the time to teach your technique. Again let me thank you for this wonderful site. How I wish I could find the time to stitch every day! Next I would like to ask you if you have a collection of paisley patterns along the lines of the “Church patterns for embroidery”. I am itching to make a small item in a paisley design. 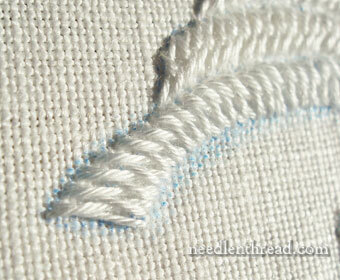 Finally, if one were monogramming fine percale pillowcases, which thread would you use for a white on white design? I am Tripti from India. I was going through your video on basket stitch and found that this stitich is very common in India, particularly, Gujarat, the state that I hail from. But we do it differently and I think that our method is much smarter, since it leaves the fabric’s backside very neat. I would like to share this with you. Me gusta mucho lo que haces y te sigo para aprender lo que veo. Me gustaría hacer un curso o taller pero no sé dónde, si puedes darme información te estaría muy agradecida siempre.